India Introduces Rs 20 Coin: 5 Stunning Facts You Should Know! The design of the new Rs 20 coin is something which have never been seen before. For the first time ever in India, Govt. has introduced Rs 20 coin. As of now, coins of denominations inRe 1, Rs 2, Rs 5 and Rs 10 are in use. As per details coming out, Rs 20 coin will have a unique design which has never been seen or heard before. Shape: The newly launched Rs 20 coin will have a 27 mm “dodecagon” shape. A dodecagon is a 12-sided polygon. Hence, Rs 20 coin will become the first such coin to have this unique shape of 12-sided polygon. Different From Rs 10 Coin? : Rs 10 coin is also 27 mm in diameter but has 100 serrations on its edge. However, Rs 20 coin will not have any such marks on the edge, making it smooth and flawless. However, there is one common feature of Rs 10 coin here: two-toned. Both Rs 10 and Rs 20 coin will be two-toned. 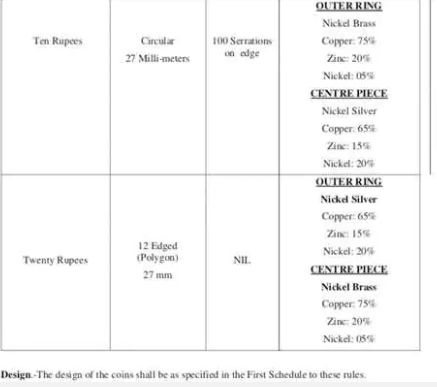 Materials Used: The outer ring of the new Rs 20 coin will have 65% copper, 15% zinc, and 20% nickel. Meanwhile the inner circle or disc will have 75% copper, 20% zinc and 5% nickel. As per another set of reports, Govt. will soon release new dimensions and new designs for Re 1, Rs 2, Rs 5 and Rs 10 coins as well. The Need For Rs 20 Coin? Rs 10 coin the largest denomination of coin used in India right now, but its usage and practicality have been questioned since long. Rs 10 coin was launched in March, 2009, which is exactly 10 years ago. Since then, the coin has received 13 iterations, but problems persisted. Between 2017 and 2018, traders and shopkeepers in some part of India refused to accept Rs 10 coin, citing fraud and fake coins in circulation. People were troubled, as they had Rs 10 coins, and they cannot be used. Last year, Govt. had to intervene and issue a notification stating that all 14 variations of the Rs 10 coin are valid, and no one can refuse to accept them as they were legal tenders. Most probably, this confusion over Rs 10 coin led to Govt. introducing Rs 20 coin with a new and stunning design so that there exists no more confusion. However, in January last year, a report emerged that Govt. will reduce minting new coins, to indirectly push people for digital-based transactions. It seems that the plan has changed now, as all the coins are being revamped, and Rs 20 coin is being introduced. "India Introduces Rs 20 Coin For The First Time Ever: 5 Stunning Facts You Should Know! ", 5 out of 5 based on 3 ratings.